Could any two investments seem more different than precious metals like gold and silver versus digital currencies like Bitcoin, Ethereum, Ripple, Litecoin and their numerous brethren? One is dug from the ground, forged in flames and hurts like heck when you drop it on your foot. The other is purely digital, created by computers crunching complex equations, existing only in bits and bytes. Yet they actually share a great deal in common. The original cryptocurrency, Bitcoin, was even purposefully designed to mimic some of gold’s unique natural properties. You even “mine” for new Bitcoin digitally like people mine physically for gold, and the supply is purposely limited. Because they have a lot of similarities, they appeal to many of the same investors. Still, for all they share, precious metals and cryptocurrencies are very different assets that serve vastly different purposes in an investor’s portfolio. It’s useful for investment purposes to understand these differences. For the sake of simplicity, we’ll stick mostly to the Model T’s of both metals and cryptos: gold and Bitcoin. We’ll also touch on fiat currencies (“cash” to keep things simple), silver and alternative cryptocurrencies (i.e. “alt-coins”) when fundamental differences also apply. In the end, gold and other precious metals have long served a role in portfolios. Bitcoin and alt-coins are emerging as a powerful innovation, both as a possible complement to — and, in thus far rare circumstances, a replacement for — cash or precious metals in many applications. As the market comes to grips with cryptos, however, it’s increasingly clear there is a place for each in the world, and none of them — not cash nor gold nor cryptocurrencies — are going away anytime soon. Will crypto competition hurt Bitcoin’s value? So, let’s start with what makes each unique. Then we’ll compare those features side by side for an easy illustration of where both fit in a portfolio. No one’s making any more. All the gold on Earth is the likely result of supernovas billions of years ago. Unlike a modern “fiat” currency, no politician can just will more of it into existence. And despite many attempts, there’s no alchemy that can create more. Part of gold’s value is intrinsically tied to its supply, limiting the effects of inflation or even causing deflation – bad for governments but good for savers. It’s easy to “coin”, yet lasts forever. Plenty of physical items have served as currency over the millennia. But unlike salt or cockle shells, gold emerged the winner in part because you can beat it to a pulp with no ill effects, yet it can be divided into near-perfect uniform chunks that stay that way. Gold is an inert metal that never corrodes. It can be pounded into a strip a few atoms thick without breaking. Yet it’s comparatively soft and easy to shape — malleable, as they say. This makes it ideal for making into coins and bars that will remain stable for centuries or millennia to come, whether they are gram-sized slivers or brick-sized bars that weigh many pounds or kilos. That’s why buried and sunken treasure always involves some form of gold coins that are inevitably found in good condition. It’s difficult to counterfeit. Those same unique properties of gold mean experts have many ways to verify the authenticity of coins and bars. In the very worst case, it can be melted down in a process called an assay, then recast to ensure there is nothing but gold in a bar. And this can happen again and again with little energy required to ensure the gold is real. Gold’s unique physical properties have long made it an ideal form of coinage. Since the times of ancient Egypt and ancient Rome, and even well before, it has been accepted as a reliable store of wealth. This history alone has turned gold into a modern economic asset with trillions of dollars’ worth in circulation, trading hundreds of billions of dollars every day around the globe. Gold is, simply put, where the wealthy — from nation-states down to savvy individuals — store the portion of their wealth they want to keep safe from political turmoil. It’s been passed down from generation to generation. It performs as a safe haven asset when other markets crash or local currencies collapse. It is, in financial terms, the ultimate hedge — the preeminent insurance policy against black swans. Bitcoin was designed to share many of gold’s unique properties, and even one-up it in some interesting ways. Cryptocurrencies like Bitcoin allow people to transact with each other, using the internet, anywhere on earth and trust the results as fraud-free. Bitcoin’s use of cryptography to achieve these goals allows for some interesting side effects. For example, the use of “public key” and “private key” digital signatures (the same basic technology behind a secure connection from your browser to a website) is like having two account numbers: one for deposits, and another for withdrawals. The only thing other people can do with your public key is send funds to you. It’s your private key that gives you access to send funds, and you need not ever share it with anyone. You could put your public key on a billboard if you wanted to and your funds would still be secure — without your private key, money cannot be withdrawn. However, this also means that, just like gold and cash, whoever last took possession of a coin is the official, sanctioned owner of that coin — even if by hook or crook. Just like cash in your wallet, or gold in a home safe, Bitcoin makes a tasty target for would-be thieves. You must keep your Bitcoin private key exactly that, private, to prevent your coins from being stolen. Its security is entirely your responsibility. And once it is lost, there is little hope to recover it, as the recipient can spend/sell it just as easily as you could. That’s because Bitcoin is another “bearer” instrument. Whoever possesses Bitcoin — or gold or cash — owns it and can claim its value, short of an intervention to physically repossess it. Long before the age of computers, when companies issued bonds or stocks, they were bearer instruments. You showed up at the right place with your bond in hand, the issuer checked to ensure it wasn’t counterfeit, stamped the certificate as paid, checked off the same on their own book and paid you the interest. This is why Hans Gruber wanted those bonds bad enough to hold those people hostage for hours at gunpoint: He could show up and collect the cash with no questions asked. Bearer bonds went the way of the dodo with the electronic age. Instead, big Wall Street firms and their ilk started to keep those types of documents centrally, with firms like the Depository Trust & Clearing Corporation (DTCC) in the U.S. and local equivalents around the world. The clearinghouses could record when items changed hands, when interest was paid, etc., all without the certificate ever leaving the safety of the ultra-secure vault. Then computers came along and the DTCC morphed with them into an almost purely digital firm with the same purpose of updating ownership and debt records without the need to physically transfer bearer instruments. In a way, Bitcoin takes us back to those times. As a pure bearer instrument, if a thief gets hold of your coins, you’ll likely never get them back. For this same reason, most people keep their money in a bank, or their gold in vault storage. It’s safely held by professionals and easy to transfer electronically. Similarly, many Bitcoin users choose to keep their private keys in online services. But, like the early days of deposit banking, these upstart institutions have found themselves the targets of unscrupulous robbers who will go to great lengths for that bounty. And, with their digital nature, there’s no need to lug around heavy bars or keep a getaway car running — often only seconds of vulnerability is enough for a robber to get away scot-free from halfway around the globe. In February 2014, the Japan-based Mt. Gox cryptocurrency exchange admitted it was hacked and about $500 million of Bitcoin was stolen from users. The company declared bankruptcy and no one was paid back for their losses. In August 2016, popular exchange Bitfinex was hacked and $65 million in Bitcoin was stolen. The company repaid customers, but it took more than months. In December 2017, South Korea-based NiceHash had $63 million in Bitcoin stolen, allegedly by hackers from North Korea. The company declared bankruptcy the next day and nothing has been repaid. Users who kept their private keys stored in various services using text message based “two-factor authentication” once thought secure had their SMS messages hijacked and their bitcoins stolen in unknown amounts, and little if any was ever recovered. In January 2018, Japan-based Coincheck was hacked for $530 million worth of a popular alt-coin in Asia called NEM. This case has at least a somewhat happy ending, as the company paid back owners using its own funds in just two days. A portion of the funds from these hacks have been repaid, but most has not. It’s all come down to whether the companies trusted with the money had the resources to cover the hack out of their own profits. Unlike a bank for cash or a vault for precious metals, none of these crypto companies are required to, or even able to, carry insurance on their “deposits”. And for many customers, legal action is not feasible as they were often dealing with companies based in questionable, foreign jurisdictions like Slovenia. Who, exactly, are you going complain to? Work only with a trusted company based in a country with a strong rule of law (especially if it’s not the same country in which you reside). Look for top-notch, third-party security. Insist on insurance to cover 100 percent of your investment’s current value, also from a third party. One advantage some users seek from cash and gold is privacy. While there is no such thing as a truly private transaction, no electronic record necessarily needs to be created that records who paid whom and where/when. For some people, that is important. Bitcoin, on the other hand, requires that very information — who and where and when — to function. Which means it’s not particularly private without its users going to great lengths to obfuscate themselves. This surprises some crypto investors, as they assume they’re anonymous, just like they can be in a web discussion group. But with Bitcoin, each and every transaction ever completed is recorded on its public ledger, including both the sender’s and receiver’s wallet addresses and digital signatures, authenticated by their public keys to prove it was actually them. While wallet addresses are just random numbers, once someone knows your public key, they can find every transaction you’ve ever completed on the network — your wallet is just a pseudonym like the pen-name of an author. If a government comes knocking at your favorite crypto-exchange or online wallet looking for your public key, it won’t be long before they can backtrack all of your activity. Similar techniques have already been used to jail a few notorious “darknet” criminals. Many popular services try to engineer around these limits by generating multiple wallets for every Bitcoin user, even a new one for every transaction. But access to the service and its records would quickly pierce through that — providing some public privacy, but no protection from something like a subpoena. Some alt-coins have attempted to provide complete privacy through the added use of cryptography. However, few are particularly popular as of this writing, and while they have convincing math which claims to prove their anonymity, none have been tested on a widespread scale by the ever-devious and creative hacker. If you’re looking to learn more about how Bitcoin and other cryptocurrencies work, check out the eighth episode of Mike Maloney’s smash hit docu-series, Hidden Secrets of Money: The Cryptocurrency Revolution. In it, you can follow Mike’s own personal quest to understand the fascinating new technologies. Gold’s primary purpose in most portfolios is as insurance — something that’s value is generally stable most of the time and is on standby to serve a specific purpose when needed. In other words, gold is boring. And that’s how you want it. Between more speculative assets, whose value changes with the whims of traders, like stocks, bonds and even currencies, gold is meant to be a stalwart. You buy it, pop it in a safe and hold it. Big ups, which can be highly profitable, especially if your cost started at a few cents; many a story was told when Bitcoin zoomed past $10,000 USD. And big downs: Over its first six years of active trading, Bitcoin fell more than 10% in a single day dozens of times. As you can see below, compared to gold, Bitcoin is a highly volatile asset, the kind that speculators and gamblers alike are really drawn to. Until it finds wider commercial uses and more buy-and-hold-minded investors, it’s likely to remain that way. The takeaway is simple: Gold, with its stable of long-term-minded investors — from the world’s largest governments to the generational wealth of family offices — has a history of retaining its purchasing power with relatively low volatility over many decades. Most of the time. But don’t mistake gold’s normally low volatility for a non-performing asset. When economic or monetary conditions deteriorate, gold’s role as a hedge moves to the fore and shields investors from losses. This was a wakeup call for many investors come the market crash of 2008, for example. You’ll recall how hard many investments were hit at the time during the extreme, pervasive uncertainty around the globe. While the gold price initially fell in tandem with stock and bond markets — due largely to liquidity needs at the time drawing money out of all assets — it ended 2008 up 5.5 percent. And over the next three years, it nearly tripled, eventually gaining four times the amount the markets lost. The same thing happened in the late 1970s — during a period of two recessions, an energy crisis, sky-high interest rates, runaway inflation and a flat stock market, gold rose over 700 percent from its 1976 low to its 1980 peak. There are many examples from history like this, where gold buoys and sustains a portfolio precisely when most other investments are failing or at least underperforming. Wall Street types call this inverse correlation, or low beta, which means it tends to move in the opposite direction from the stock market. And it’s why you’ll find a bit of gold on every heavy hitter’s balance sheet, from the U.S. Federal Reserve to Goldman Sachs. What you may not know is that Bitcoin was born in part as a reaction to that market panic and volatility of 2008. Investors who saw fiat currencies pumped into the banking system to save it, when those very banks appeared to have caused the crisis, grew frustrated. They sought out ways to insulate their savings from the political class in many ways, from returning to gold in large numbers to the invention of cryptocurrencies. The valiant goal of Bitcoin was to make a digital asset that mimicked the best attributes of gold without its notable downsides (like the inability to make a piece of pure gold worth a penny or two that’s any larger than dust — a piece of gold the size of a penny fetches a few hundred dollars U.S. these days). Unfortunately, Bitcoin hasn’t been around quite long enough to know how well it will fulfill its self-anointed role. For instance, we’ve yet to see how it will act during a market crash like 2008. Despite its roots, Bitcoin’s initial rise occurred in tandem with almost all other assets in the world, from the U.S. dollar to global stocks and bonds, rising to historic proportions in one of the longest bull markets of the modern era. Meanwhile, gold prices have dropped by one-third during that time. 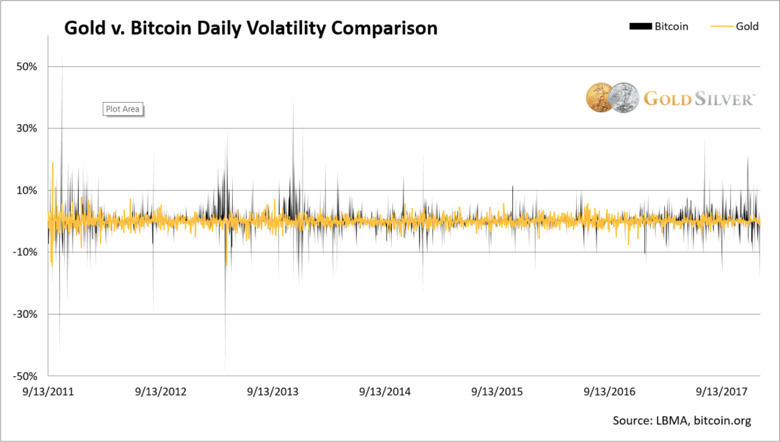 If that massive growth in asset values reverses, and liquidity dries up, what will become of Bitcoin’s price? Bitcoin partly inspired sci-fi/fantasy author extraordinaire Neal Stephenson’s action thriller novel, REAMDE. In the novel, a video game’s digital currency, based on those favorite physical properties of gold among independent money advocates — limited in amount, and progressively more difficult to mine — becomes the most stable currency in the world as governments all fall victim to their own greed. People trade into and out of the digital currency from their local ones, through the online game’s marketplaces, creating an ad hoc global ‘forex’ market. One that international criminals then depend on for their ransomware demands… sound familiar? Yet some have suggested Bitcoin itself was inspired by another, earlier book also by Neal Stephenson, Cryptonomicon, about the founding of an independent digital currency that is purely digital… but backed by gold once stolen and ferreted away by the Japanese during WWII and unearthed decades later by intrepid ‘white hat’ hackers. Of course, we cannot interview the Bitcoin whitepaper’s author(s) to validate, but what an ironic twist that would be. 8. The Big Question: Is Bitcoin Money? One of the big arguments for Bitcoin and its cousins from the core community is that it is more than just a medium of exchange. It’s not just some temporary account between other assets; it is in itself an asset with long-term value that will hold up or even rise when other markets are falling. It will, they argue, arise as a democratic form of money simply from its usefulness in trade and the trust its features engender — just like gold. It would be easy to pay this topic short shrift and cite how little of Bitcoin’s volume is used to actually transact. Sure, you can book hotels on Expedia, buy furniture on Overstock and even invest in physical gold and silver. But, going on almost a decade since the whitepaper’s release, the overall volume of bitcoin used in commerce is tiny compared to that simply traded by speculators each day, or even just used for gambling (seriously, Bitcoin gambling is big business). Still, it was designed to transact with confidence. And variants like Bitcoin Cash aim to make that process faster and cheaper, addressing the big detriments of the original. But that still doesn’t make it “money”. Heck, a lot of the currency in use today around the world is not money. Maybe even all of it. Gold is most certainly money. It’s been used as a medium of exchange and a store of value for millennia. Governments, banks and countless individuals rely on that store of value today — the U.S. government alone holds $350 billion worth of gold in reserve. But the world’s governments moved away from the gold standard — backing a currency with deposits in a vault, free to exchange at any time, as many currencies were for centuries — starting in the early 1900s and accelerating in wake of the world wars. The move made the price of a currency solely a function of politicians’ ability to tax people in the future to pay back the money they borrowed today, by a stroke of the pen, or by “fiat”. All world currencies are now fiat. And inflation — the steady eroding of their value by inflating the amount of it available year after year — is built into them by design. This process taxes savers by constantly subtracting value. Inflation is why a candy bar no longer costs a nickel, or why the price of bread doubles in a generation. Sometimes this purchasing power takes a long time to erode, with interest paying out to balance inflation, like in the U.S. over the past half-century. Other times, it deteriorates in just a handful of years, as history has seen many times, including in the last half-century: Zimbabwe, Argentina, Thailand, Iraq, Venezuela and on and on. Savers in those countries can attest that their fiat currencies were most certainly not stores of value over the long term. Like gold, cryptocurrencies offer users another way to opt out of the current monetary and banking system, and into an asset with controlled and predictable supply increases — and that can be enticing. After all, Bitcoin was designed with a purposefully limited amount. The idea was that, by taking away the power of any dictator or legislature to print more into existence, it would not suffer from long-term inflation once the majority had been mined. That growing demand and limited supply would make it grow in value over time, not shrink — the process economists call deflation, where goods get cheaper and cheaper as the currency’s value grows. Spinoffs like Bitcoin Cash and the proposed Bitcoin Gold (which has no connection to real physical gold) create new, albeit slightly different, supply spontaneously with “air drops”. Could an increasing amount of these dilute the purchasing power of an original Bitcoin? Has the first already done so? New cryptocurrencies with different or better features are already being produced by the hundreds. Each is competition with the original, typically created in vast quantities quickly like the early days of Bitcoin, and one might argue they’re just “more of the same” in many cases. Could the explosion in alt-coins detract from Bitcoin’s value? Could you end up being the last person holding a currency that others have flocked away from in favor of something superior? These concerns may not come to pass. But the point holds: It is too early to tell if Bitcoin or any digital currency is actually money because the purchasing power has been so volatile since inception and there simply hasn’t been enough time to establish its ultimate role. Betting on any form of money is a long game, and the wise place multiple bets. Mining bitcoin involves using computers to solve complex math problems. Bitcoin is capped at 21 million units, and gets harder and harder to mine over time. More than 80% of all bitcoins have been mined already, though it’s estimated it will take until the year 2140 to mine them all. The supply of gold is dependent on the amount mined out of the earth’s crust. The amount of gold that exists is finite, and the remaining supply is steadily falling. It’s estimated about 165,000 tonnes (5.3 billion ounces) exists above ground today and about 4,500 tonnes (144 million ounces) per year are added from mining. Bitcoin is stored in a digital wallet either hosted by an online service or as code on a private device. Some have guessed that the majority of Bitcoin is held in online services; because you can create many addresses at a time and never use them again it is impossible to know for sure. The public ledger of bitcoin eliminates the need for central authorities to track ownership, though some online services do not settle transactions to the ledger raising questions of what happens in cases of bankruptcy. If private keys are lost to device failure, like from a crash or disaster, bitcoins cannot be recovered. As a bearer instrument, theft is always a concern. Most online storage is not insured, as options are very limited and expensive due to the history of thefts and hacking. Most gold investors choose to store their gold in secure vaults, directly or through futures markets. Some investors manage their holdings personally with home storage, bank deposit boxes (which are uninsured), or other offline methods. Storage systems generally rely on warehouse receipts to prove ownership and can be recovered through courts, via insurance, and elsewhere. However, users must trust the central authority, so should insist on full independent auditing. Gold is not destroyed by natural disasters. As a bearer instrument, theft is always a concern. However most professional vault storage is fully insured by third parties. 10. Where Does It All Fit in a Portfolio? We’ve never split hairs over digital currency here at GoldSilver.com. For years, founder Mike Maloney has shared his personal journey into Bitcoin and the crypto world. He and many of us believe the technology is revolutionary in many ways, opening the currency markets to millions, maybe eventually billions, around the world who until now were completely locked out by policy or circumstance. It’s been a remarkable democratizing force. But it’s still very early in the life of an entirely new type of financial instrument — one whose whole existence is a function of the faith its users put in it. In that way, it’s not unlike gold or any other currency, where the market determines its value. But without a history of how it behaves through events like a currency crisis, a stock market crash, high local inflation, deflation or stagflation, it’s a gamble largely based on dreams of what it could become, not a bet on what it has been. Gold, on the other hand, has literally thousands of years of history behind it. From kings and queens to pirates, bankers, institutions and the modern-day bullion investor, gold has served as money and a store of value for not just decades but centuries and millennia, regardless of wars or revolutions, inflation or depression, monetary upheavals or even manipulations of central bankers and politicians. If you’re one of those lucky few who made a small (or large) fortune in the early days of Bitcoin, hats off to you. We know quite a few of them, including our own founder Mike Maloney, who has publicly shared with followers his own forays into Bitcoin et. al. since 2014. And many of those early investors are now choosing to use gold as a complement to their cryptos. It’s where they park their money when volatility spikes or they start to worry about political pressures, theft or other issues. Gold is a natural pair trade, historically more stable than the fiat currencies (or digital tokens tethered to them) that otherwise serve the role for many crypto investors. It’s also a way to diversify their holdings. Gold has historically done well when other currencies and markets weaken. It’s probably a pretty safe bet that if Bitcoin ever hits rocky times, gold will make an excellent hedge, just as it has for stock and money markets for a long, long time. All this is to say that we believe gold plays a vital and unique role in any modern portfolio. Cryptocurrencies like Bitcoin will too, for many investors. But those roles remain quite different, albeit complementary, and are likely to stay that way for some time to come.